Yesterday’s rain, which reaches 2300 meters, has led to a lot of visible avalanche activity as you can see from these full depth slides on the east side of the Chartreuse. The avalanche risk in the Isere was 4 yesterday and it is the first time I’ve known the pistes at our local resort of St Hilaire du Touvet to be closed due to avalanche risk. A wise decision I think. The pistes have held up, more or less with a few bare patches. Should be ok if we get some more snow this week but it is very mild at the moment. Fresh snow expected across the region tomorrow with the skier triggered avalanche risk rising during the day. After some torrential rain the snowline has now dropped down to the 1100-1300 meter range. Like you David I have seen lots of natural releases on all aspects and up to fairly high altitudes. The rain should help purge the snowpack and get rid of any layers though shouldn’t it? And with varying freezing point how does this effect the snowpack? a bit of rain is never a bad thing but we’ve had too much low down. Anyways, around 20cm of fresh at 1600m in the Chartreuse, 10cm at 1300 m. 40 cm at 2200 meters in the Belledonne, all accompanied by a lot of wind. There seems to have been less snow in the Savoie in the end. Just been out skiing on it for a couple of hours, below us down to 1200m it’s challenging a few cm of snow on crusty, rain affected snow. Back up at 2000m it’s not exactly perfect but it’s not bad, maybe 10cm of fresh snow on a reasonable base, not enough to really cover frozen tracks so it’s not being skied much even though the lifts are pretty busy. Piste conditions are really great for people though, nice firm base, not cutting up much and no icy patches. The fresh snow is sitting on the trees so everything looks great and it’ll be nice on snowshoes this afternoon. Quite surprised by today’s conditions. 20cm of powder on a firm base, this picture was taken looking down from 2000m and it remained pretty much perfect as far as 1500m, then the base got soft and it was a tricky ski. We managed second descent, by lunchtime it would have been 30 on the ever popular Tete du Bostan. Yesterday looks like the best day for skiing for some time. Hoping conditions improve for the end of the week. Very warm overnight again round these parts, +2 at midnight at 1800m the temperature only started to drop at 5am, -3 now so that gives a snow/rain level around 1100m. Bizarre temperatures as it was only 3C in the valleys. There was something like 40cm of snow between the 2nd and 3rd at 1600m around Grenoble. The wacky weather continues. Ski touring conditions were poor yesterday. Last night it was -6C at Chamourousse and it climbed to +1C at 5am before dropping back a bit later. At the same time it was +2C in the valley. A very mixed (up!) atmosphere. Four ski mountaineers from Vorarlberg were killed on Tuesday afternoon at 2,800 meters altitude in the Swiss canton of Grisons, on the Juferhorn by a slab avalanche. The group actually consisted of five experienced winter sportsmen. But on the way to the summit 52-year-old Elizabeth K, who was not climbing well, decided to turn back. Her husband George (52) and her son (23) -, and the two friends Monika and Kurt D. were caught shortly afterwards by the avalanche. The 23 year old son was the first to emerge from the snow. Frantically, he searched with his beacon, also carried by the survivors and it was the friend of his father, the 50-year-old nurse and hospital staff representatives in Dornbirn, Kurt D. that he found unharmed. They alerted the mountain rescue. The rescue workers locate the two missing people in the 70 by 150 wide avalanche deposit. The husband and wife were buried 100 and 120cm deep respectively. For the 52-year-old otolaryngologist George K., who also worked at the hospital Dornbirn, help came too late. The seriously injured wife of the trade unionist, Monica D., died at the Kantonsspital in Chur. The avalanche risk was 3 at the time, the accident occured on a NE slope, angle 36-40° at 2730 meters altitude. Avalanche in the les Menuires/Val Thorens area yesterday. 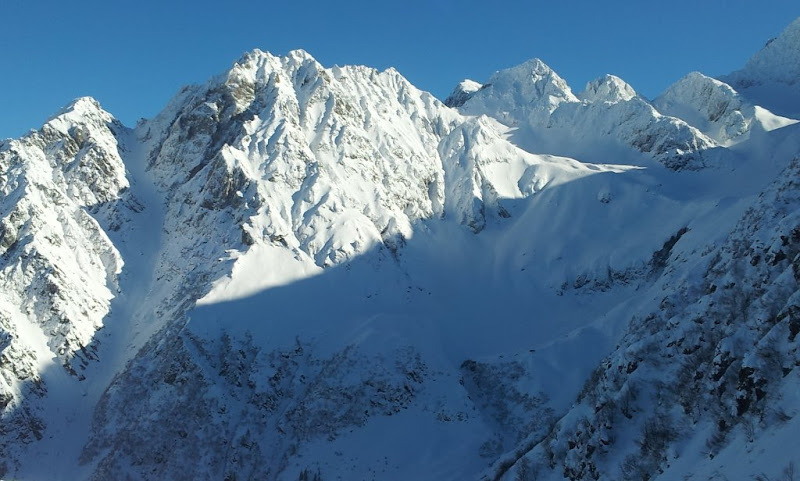 5 off piste skiers were descending the Pointe de la Masse towards the lac du Loup aux Menuires yesterday at around 15h00 when they triggered an avalanche at 2600 meters altitude. One of the group was buried but one of his poles was poking out of the snow. This enabled his friends to find him and dig him out. He suffered from some broken ribs aftar a collision with an object during the slide but was otherwise ok. Due to bad weather he was evacuated by sledge to resort level where he was taken by helicopter to hospital. I put that in bold because if he had been completely buried it would have taken a lot of time to get a probe line organized in the poor conditions and he would probably be dead now. Saturday was a piste day in the Chartreuse and Sunday we toured in the Vercors. There has been quite a lot of high altitude rain - up to around 1300 meters with the temperatures yoyoing around. This has stabilized the snowpack below 2200m. Thursday / Friday saw another 60cm of snow at 1500m in the Chartreuse and Vercors, then high winds over Friday / Saturday. The result was some accumulations in bowls but a lot of hard icy snow elsewhere, Not exactly the best ski conditions. There was less snow in the Belledonne, around 30cm at 2300m. You can tour from 800m, but this is pretty exceptional, we are talking about very sheltered north facing starting points in deep, cold valleys. More typically you can find about 10cm of dense, skiable snow from around 1000m. Icy conditions have been a problem elsewhere, In the Pyrenees two Spanish skiers were killed yesterday after a tour from Formiguères (Pyrénées-orientales) and a companion was seriously injured. The slid 100m in an icy couloir and hit trees around 15h in the vallée du Galbe. The rescue services flew a number of missions yesterday to rescue backcountry enthusiasts surprised by the ice. 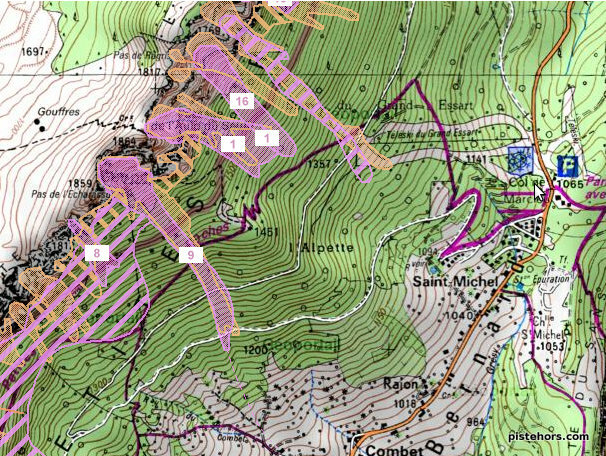 A ski tourer was injured in the same area on the 1st Jan 2012 after sliding on ice while descending the Pic de Mortiers. I’ve been laid up in bed all weekend but conditions have not evolved much, apart from being very icy in the mornings. Here is an avalanche that happened on Wednesday between 11-15h on the popular Aup de Seuil route in the French Chartreuse. The route is very popular, particularly over the last few years with its frequent publication in ski community forums. Proof, if any were needed, that basic rules such as timing need to be remembered. The avalanche occurred between the passage of a group at 11am and another just after 3pm. 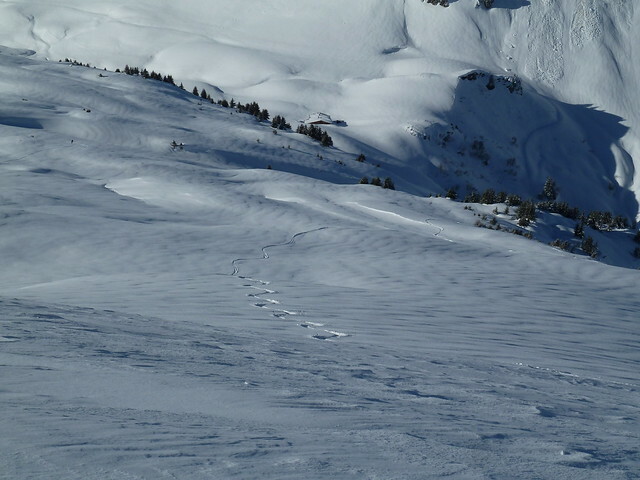 Most of the couloirs on the east side of the Chartreuse (Gresivaudan valley) have purged over the last days. The cross country ski trial between St Hilaire du Touvet and the Col de Marcieu was closed due to the risk of avalanches, with good reason looking at the debris. Couple of slides in the same area on the side of Mont d’Or (the one near Leysin), pretty much south facing at around 1500m. Pretty much exactly what the bulletins have been warning about, these slides are a couple of days old although the one on the foreground of the first photo seemed to be from yesterday. It is quite a bit colder now which should slow down any futher activity until the fresh snow blows in on Thursday (at what altitude? Maybe rain to 2000m at the start of the storm with light snow to valley level over the weekend). Will the current bout of anticyclonic weather have been enough to form any weak layers? Higher up the snow depths may stop this although the TGs can be quite variable within the snowpack be interesting to see where this goes? My feeling is the inital rain to higher altitudes will keep things stable after an initial increase in avalanche risk from 1 up to 3. I was out with a group yesterday and we had great fun glissading (on snowshoes) through some really deep surface hoar on a solid base. To be fun it was steepish slopes and deep, if it gets buried it won’t be quite as much fun so a bit of rain would be quite handy. PS. SLF are suggesting it’ll peak at HIGH on Saturday. High? Interesting. Alain Duclos has said he’s seen some surface hoar around the Haute-Maurienne which he thinks will cause some problems this weekend. Snowing here now above about 1000-1200 meters. Should drop to 800m over the afternoon. Viz is too poor to make it worth going out. There was an avalanche in the Couloir Philippe of the Grands Montets (Chamonix) this morning. Triggered by a group of 3 skiers, one broke a leg in the slide.